Razer's CEO Min-Liang Tan could possibly be one of the most active and most engaging top CEOs on Facebook. If you're a huge Razer fan and haven't 'liked' his page yet, you might want to do so here as quite often do most Razer announcements, not to forget giveaways too, come directly from Tan himself, a CEO I've always found myself looking up to. Recently, Tan posted several photos of Razer's latest product, the Razer Kraken Signature Black Edition. The original Kraken was already a sight to behold, and with a pure all-black edition, it was really, really tempting. 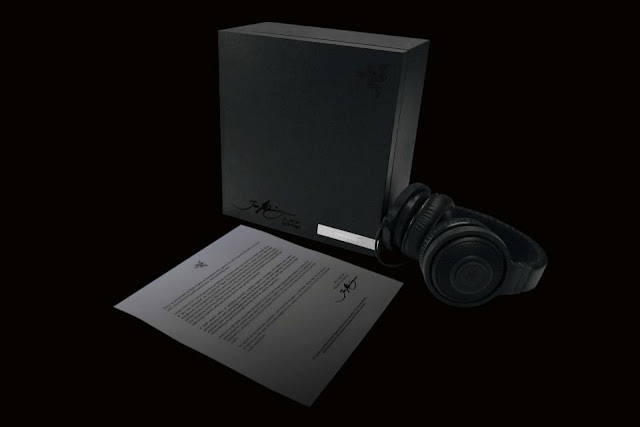 The downside was, Razer's Signature Black Editions are always limited, in fact, extremely limited as they are only exclusively produced as a sign of appreciation for their closest friends and partners at the company. As explained by Tan, "every year, we design a Black Signature edition (limited to 1337 units) that bears my signature. These products are not for sale and are individually serialized and marked - and gifted to our closest friends and partners at Razer." Though well yes I definitely do wish I was one of their 'closest friends and partners', it's really inspiring to see such a huge company making all these efforts for those they respect and appreciate most. Who knows, maybe one day, hopefully, cross my fingers, when I do get a chance in interviewing Tan (one of my personal goals), I may just get a step ahead. But till then, I'll just drool at it.